Ovation of the Seas moves its homeport with the seasons in a grand circle, including Tianjin (Beijing’s seaport), Hong Kong, Singapore, and Sydney, Australia. Cruises cater to Chinese passengers when the ship sails from China. Gone was Johnny Rockets, a fast food mainstay of Royal Caribbean cruise ships. 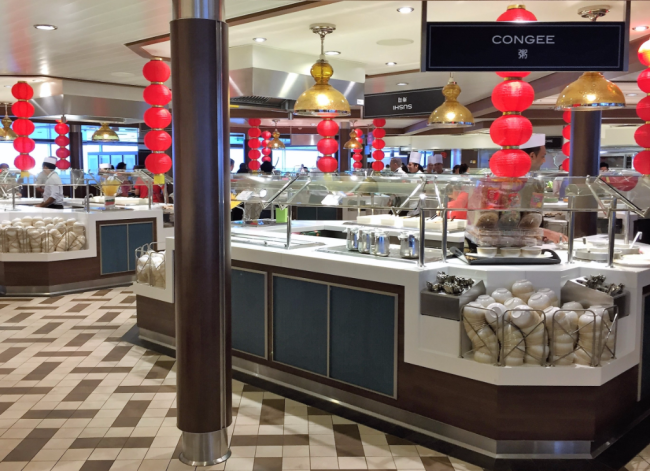 So, a meal of burger and fries was difficult to find on the 4,180-passenger Ovation of the Seas during a five-night voyage into the South China Sea. No problem, however, if your taste runs toward noodles. 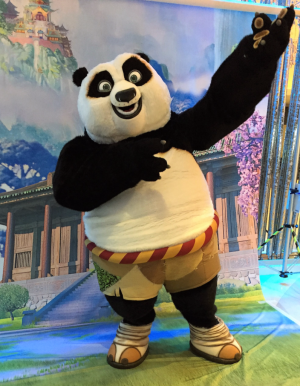 A new, flashy Kung Fu Panda Noodle Shop was ready for business on the sun deck. At the breakfast buffet in the Windjammer Marketplace, congee and its side dishes were spread out over an entire station, accompanied by pickled mustard plant, salted duck eggs, Chinese mud carp, bamboo shoots, pickled tofu and some other items I did not recognize. Not on the breakfast buffet menu, though I learned later during the cruise that such a request was possible during non-peak hours. Pre-cooked fried eggs were piled into a big bowl, because passengers in China do not want to wait for such items to be prepared for them, explained Orlando Rosa, the ship’s food and beverage manager. At lunch, a lonely American food counter in the Windjammer included some pre-cooked hamburgers, a little lettuce, tomato slices and a platter of French fries getting limper by the minute, as passengers ignored this staple from the other side of the Pacific Ocean. Meanwhile, several decks below, Michael’s Genuine, an American gastropub designed by Miami’s award-winning chef Michael Schwartz, was serving little in the way of pub grub. 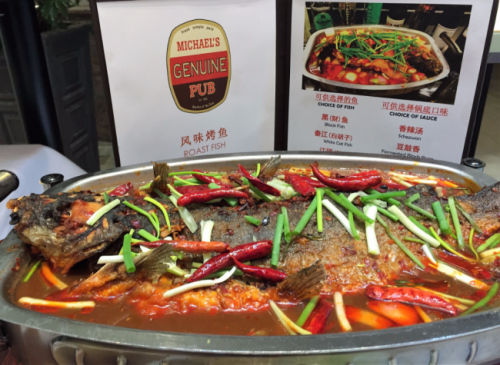 The most popular item was the daily special at $35 — an ample whole fish, with head and tail, and assorted vegetables in a very spicy Chinese pepper sauce. 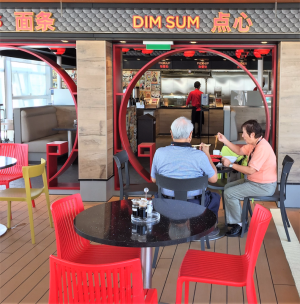 When Ovation of the Seas cruises in and around China — it is based year-round in Asia or Australia — passengers get a Chinese experience, from food throughout the ship to a second casino added for high rollers that bustled each evening while the vessel’s bars and lounges were empty. You also get shorter show productions — 35 minutes maximum in respect for Chinese preferences, said a crew member. There are long lines to get on and off the ship, as well as at peak meal times when hallways outside complimentary restaurants (included in the cruise fare) begin to fill 25 minutes before each dinner seating. Ovation of the Seas, designed for the Chinese market, was inaugurated by Royal Caribbean in 2016. I arrived in Hong Kong familiar with the layout from previous cruises on Ovation’s sister ships, Quantum of the Seas, based year-round in Shanghai, and Anthem of the Seas, based year-round in New York. Onboard were the Quantum-class restaurants and entertainment choices — the bumper cars, robot bartenders, skydiving simulator, and the North Star capsule that rises 300 feet above the sea. But missing among my 4,000-plus fellow passengers were travelers from North America. In five days, I met no one from the United States. Small, expensive luxury ships long have cruised Asian waters. 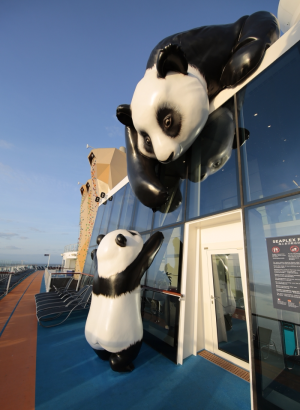 Now, the rush is on among all major cruise lines to base big new ships in China, tapping into the expanding Chinese vacation market, cruising out of Tianjin, Shanghai, Xiamen and Hong Kong. These big ships, with rates much lower than those for the small luxury ships, also present, in theory, cruising opportunities for North Americans. If, however, you are a North American who plans to fly across the Pacific to cruise on a big ship based in China, be prepared not only for all the extra paperwork and visas — which can make boarding on embarkation day much more time-consuming — but also for being a distinct minority among the passengers. I found that mixing in a sea of foreign cultures — including 169 passengers from India — was a good part of the fun aboard Ovation. North American ships tend to be relaxed and slow moving, especially among some older folks who poke along in public passageways. In China, no matter what their age, everybody seemed to speed walk, all of the time, and if I left some space between me and the person in front of me, it soon was filled by someone else. 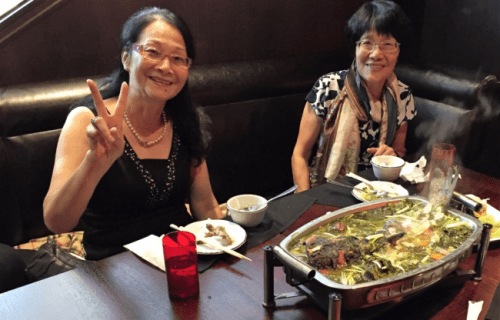 The Chinese and I didn’t need to speak the same language — most did not know English — to be polite, to laugh, and to toast one another when we met in line or in restaurants. I was a curiosity. On many occasions aboard Ovation of the Seas I was asked to join in group pictures. I don’t know how this Caucasian, with white hair and bright Western clothes, was described to family and friends back home on the mainland, but my face is now all over China. Ovation of the Seas, listed on the Royal Caribbean website , moves its homeport with the seasons in a grand circle, including Tianjin (Beijing’s seaport) during China’s summer; Sydney during Australia’s summer (winter in China and the U.S.); Hong Kong; and Singapore for several weeks or more in spring and fall when large groups of travelers from India embark. When Ovation left Hong Kong in November for Singapore and eventually Australia, the crew began a transformation toward a more English oriented ship. Burgers and fries began to reappear, and menus gradually added meat and subtracted noodles. Shows were lengthened. The high rollers casino was converted to a lounge for frequent cruisers. English-language television channels replaced some that were Mandarin Chinese. Subtle changes might hardly be noticed, such as the way the plastic inserts fit inside public wastebaskets instead of folding over the lip a few inches to cater to Chinese spitters. After a season in Australia and New Zealand, Ovation will begin its move back north in late February, stopping in Singapore for a series of cruises. 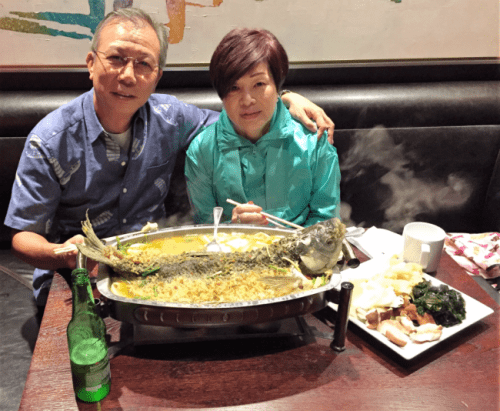 On April 14, Ovation repositions back toward Tianjin, China, where the menus will become more Chinese, the shows will be shorter, the high roller gambling room will reappear, and the burgers and fries will return to their inferior position in the corner of the Marketplace buffet. 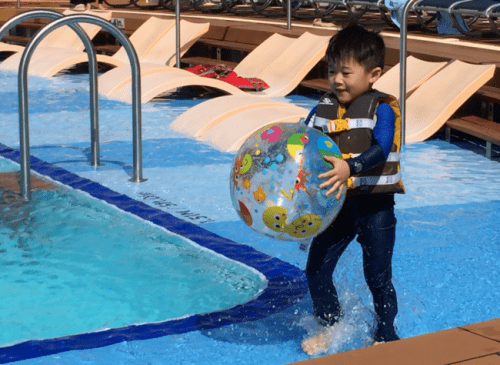 A tip: If you are considering the additional expense of booking a suite on a cruise ship, an Ovation of the Seas voyage in China is the place to do it. 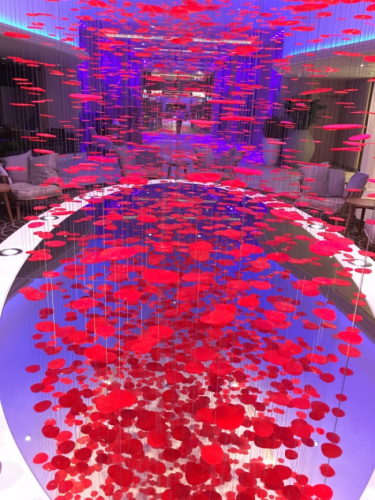 You’ll have a concierge to help make arrangements for meals, shows and tours, as well as access to the private suite restaurant Coastal Kitchen, where you will find plenty of familiar menu items, including a daily English breakfast. 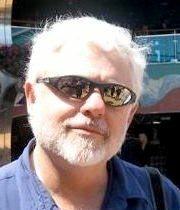 David Molyneaux writes regularly about cruising news, tips and trends at TravelMavenBlog.com. His cruise trends column is published in U.S. newspapers, including the Miami Herald, Dallas Morning News, and on Internet sites, including AllThingsCruise. He is editor of TheTravelMavens.com .